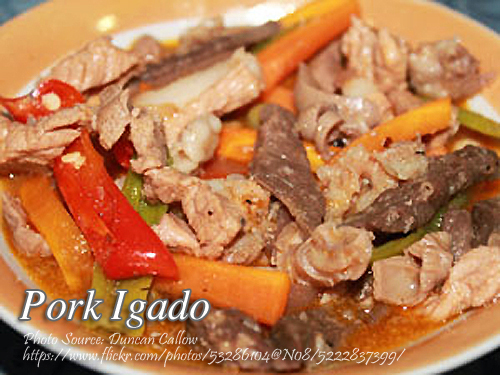 Igado is one of the popular Ilokano dish that consists of pork meat and pork innards like liver, heart and kidneys. In my opinion it is similar to preparing a kilawin or ceviche dish which is usually done in fish. But since the pork is not safe to be eaten raw because of the parasites still on the meat, it has to be well cooked. Before cooking pork igado, you have to marinate the pork and innards in vinegar. Aside from pork igado, there are also other variation like the beef igado and chicken igado. To cook pork igado; Marinate the liver in vinegar. Saute the garlic in oil until reddish brown. Stirring constantly add the pig’s heart, kidney and liver (with the vinegar ). Add the soy sauce and simmer until tender and the sauce thickens. Then add the green peas and chili peppers until cooked. I tried to cook it on our lunch and my BF loves it! Thanks! Hi Aiza, thanks for letting us know!